I had NO idea I had gotten so lucky! Right after pet battles were introduced, I was hunting for a rare Infinite Whelpling outside the Caverns of Time. While waiting for them to respawn I flew out a ways and started battling other wild pets. When I saw my first Sand Kitten, which was also a rare, and trapped it. Today I find out he is an S/S. He has been my go-to pet since I first caught him. VERY effective pet. Great self healing. Cought it as a secondary in south western Tanaris, no sandstorm needed, was night though. Caught rare as a secondary to a desert spider north of Gadgetzan. These can be a bit tricky to find around Tanaris. I only saw one roaming, but most of the time I would find a couple with other pets. That was the easiet route to get one for me. First one I found was a rare. Second to a Gold Beetle. 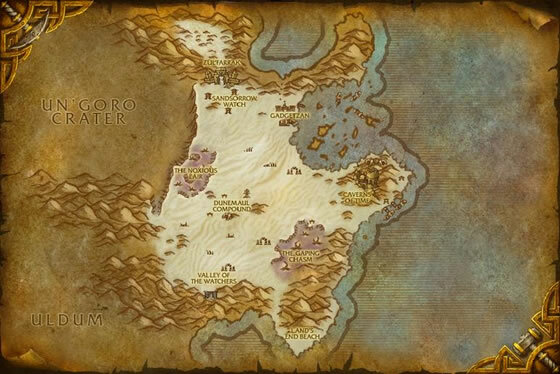 8 hours spent battling in tanaris and still no rare sand kitten, have no longer got any pets below 7th level though and picked up 2 critter and 1 beast battlestones in the hunt so far, ah well this weekend the hunt will continue again. LOL! Flying around Tanaris after battling a few pets I tabbed out of game to bounce here and check since the map said they were found all over the zone after reading all the comments I figure that I might run across one as a secondary during another pet battle so I tab back into game planning to start battling every pet I run across in hopes of getting a pretty kitty and holy smokes.. there's one circling right underneath my drake. LOL. Just a common, but I"ll take it. 10:37am on Eonar. I need this pet for the crazy for cats achievement found was as a secondary with a spider. It was rare over the moon ..
Found as a primary, uncommon S/S, 43 66 Tanaris, secondary was an UC Gold Beetle. Quite happy as I've been waiting for a sandstorm for ages to get this lil kitty. Now to start poking around for a rare! This pet should be rated much higher as a rare S/S. It can be used to singlehandedly power level pets in the area near BMAH, and it wrecks any critter pretty much anywhere. Devour lets it get 1/3+ of its HP back every kill if played at the right time, Rake is awesome opener, and it usually gets first attack as S/S. I had seen one as primary in this area before. I was in the area and the sand was blowing, so I thought I would check it again. 51 80, primary, rare. Thank you. Sitting there at 4am, really tired just leveling lowbies while wating for a sandstorm, mindlessly spamming my kun-lai runts rampage to put an end to those critters, looks up and realise that it has a blue SS sand kitten with it...i think *YAY*...kun-lai runt thinks *smash*...i named him Hodor after that cus hes so stupid. 1: irl many desert creatures are nocturnal and ive noticed the % rate of getting sandy kitty as 2nd pet is way higher after midnight server than daytime. 2: description says kept as pets once from trolls and i tend to see the kitty as secondary much more often close to troll ruins in the south. the gadgetzan theory some mention hasnt worked for me. Found one as primary in western tanaris, it was uncommon and came with a rare gold beetle. First time I saw one as a primary. 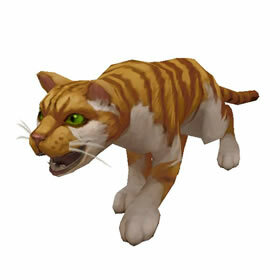 Originally bred by the Sandfury trolls as pets, these feral and savage felines prowl the deserts of Tanaris.